Firstly, there's no denying the quality of the video that the GoPro captures. We initially captured footage in full 1080p at 30 frames per second but eventually settled on 720p with an impressive 60 frames per second to give a smoother picture. Image quality was sharp and number plates were largely visible on the videos we took, which is important if you later rely on them as evidence. Secondly, the GoPro app worked faultlessly and enabled us to position the camera each morning as we were removing it from our hire car overnight. It also offered easy access to the cameras settings and, thanks to the recent update, allowed us to view and manage recorded video files via our iPhone and iPad. So, the GoPro records great video and is easy to manage. That means its a great car camera right? Unfortunately not. 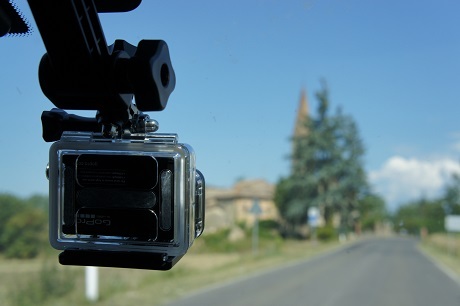 During our tests we identified some fundamental issues which limit the GoPro's effectiveness as a dash cam. Aside from the fact that when mounted on the suction cup mount it takes up a significant amount of space, the first issue that we encountered was battery life. While car cameras plug into your vehicles cigarette lighter and draw power whenever your ignition is turned on, the GoPro runs from an internal battery. In our tests, a full charge lasted around 1 hour 45 minutes which was suitable for most of our journeys, but did mean that the battery needed to be charged every evening. That was fine for the purposes of our test, but isn't a long-term solution for anyone looking for the day-to-day protection of a car camera. It is possible to power the GoPro via a USB cable plugged into cars cigarette lighter but this requires the purchase of several additional accessories, which can be expensive. The GoPro also breaks long videos up into manageable files of 17.35 minutes, seamlessly ending one video file and beginning the next. Dedicated car cameras use much smaller segments, usually just a few minutes in length, which help when your memory card is full and the camera employs 'loop recording' to overwrite old files that are no longer required. While the GoPro offers loop recording, the large video files don't lend themselves to it as effectively as dash cams. As well as this, the GoPro lacks some fundamental features that make car cameras as effective as they are. Most importantly, GPS, G-force sensors and a time/date stamp. GPS allows a car camera to plot your precise location on a map and, using this information, can also measure your speed - a crucial factor in determining the events leading up to any incident and proving your innocence. Internal G-force sensors enable car cameras to detect sudden and significant movement of your vehicle which could indicate an incident, such as a collision, sudden braking or evasive manoeuvring. Once it detects such activity, a car camera can protect the video file that was being recorded at that time, meaning that it can't be recorded over accidentally, which guarantees your video evidence is kept safe. A date and time stamp is a simple, but crucial, piece of evidence that allow you establish easily that your video evidence relates to the incident in question, should it be required. Without it, the legitimacy of your video evidence could be called into question. Other more minor issues that we encountered included overheating (possibly due to the GoPros plastic casing amplifying the heat of the sun through the windscreen) and difficulty in managing the camera without the app as the LCD screen faces forwards. Also, with its wide, 170 degree lens, the GoPro has an impressive field-of-view, but the image suffers from distortion at the edge of the frame. This isn't an issue if you're filming extreme sports, but if the video from your car camera is to by relied on as evidence, you need to be confident that what's recorded is clearly legible. As a comparison, the newly released BlackVue DR550 has a 137 degree lens, which seems to be a good compromise between capturing as much detail as possible and ensuring that it's crystal clear across the entire picture. So, in summary, while the GoPro is great for capturing a vast array of activities, it is unfortunately limited when being used as a car camera. Dash cams are purpose built to offer the ultimate peace-of-mind whenever you're behind the wheel and to do this with the minimum amount of effort required on your part after installation. The GoPro may be sufficient for a one-off journey, but it's not a long-term solution.